The products below are FDA registered medical devices. These products are intended to prevent, treat and cure Heel Spurs and their related pain. Heel Spurs are calcium deposits that can form on both the back of the heel bone and the sole of the foot. 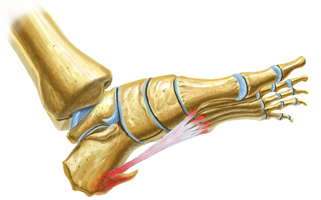 Heel Spurs located on the back of the heel bone are often caused by inflammation of the Achilles tendon. 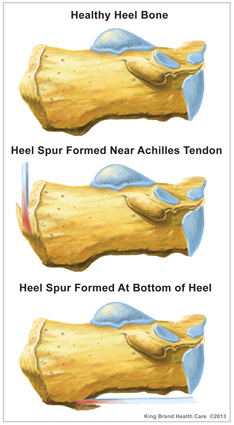 The formation of the spur causes pain and further swelling in the heel area. Heel Spurs become especially painful when pressure is applied to the ball of the foot. Heel Spurs located on the sole of the foot form on the tissue of the plantar fascia where it attaches to the heel bone. These spurs are often caused by inflammation of the plantar fascia itself. This is why many people with heels spurs also suffer from Plantar Fasciitis. Severe pain occurs in the plantar area when stepping down on the heel. If you want to get rid of your Heel Spur, you need to rest your foot. Putting further strain on the affected foot will only make your condition worse. Use crutches to help you rest the foot completely. Rest combined with regular ColdCure® and BFST® treatments is the ultimate solution for healing your Heel Spur. Use ColdCure® first to reduce any pain and inflammation you're experiencing. Use ColdCure® until the swelling and inflammation are gone. Then start using the BFST® device to promote blood flow in the area of injury and accelerate the healing process. This is the most effective treatment available for your Heel Spur. Contrary to common marketing, stretching aids such as plantar braces and splints are bad for Heel Spurs and Plantar Fasciitis. Most stretching exercises do more harm than good. The Plantar Fascia does not stretch. Think about it, if it did then people who stand or walk all day would have plantars that are stretched beyond belief. The Plantar is designed by nature not to stretch so that it can provide the structural support your foot needs to endure the full weight of your body. Stretching is not advised for the treatment of Heel Spurs and Plantar Fasciitis and will not help you heal. Stretching strains your heel and plantar which can actually damage them further and make your situation worse. Painkillers mask the pain and cause you to continue to stress and injure your Heel Spur and plantar. This only makes things worse. It is understandable that people need relief from the pain, so if you have to take painkillers try to restrict them to times when you are sleeping. Heel Spurs, Plantar Fasciitis and other conditions/injuries of the heel and sole of the foot are all extremely painful and debilitating conditions. NSAIDs such as ASA, acetaminophen or ibuprofen are often used to treat the pain but these drugs do nothing to treat the actual condition. In fact, NSAIDs are known blood thinners and make fresh tissue injuries bleed more. Cortisone injections are used in extreme cases but these too are intended to address the pain and do not promote healing of the condition itself. When you entered our site, a Foot ColdCure® and Plantar BFST® medical device were automatically put into your shopping cart. What's in your cart now are the two things you need to stop the pain and speed the healing of your Plantar Fasciitis and Heel Spur. You may go to the checkout at any time or please continue to learn more about treating Plantar Fasciitis and Heel Spurs by exploring our site. You can also find products to treat other injuries and ailments in our shop. Wear a ColdCure® wrap as much as possible. This will help decrease the inflammation and protect your heel from further damage while you heal. Whenever you need additional pain relief, swap out the RigiGel® with one from the fridge or freezer. Avoid re-straining the injury as much as possible. Giving your foot a rest is hard, but it is very important in the early stages of healing. Do this and your Heel Spur can truly heal - Finally. For dealing with swelling and pain associated with Heel Spurs, nothing works better than cold compression. ColdCure® technology was developed specifically to address the need for a cold compression device that does not freeze the skin and underlying tissue. As a result, ColdCure® therapy can be applied for extended periods of time, providing superior relief from the pain and swelling that comes with Heel Spurs. 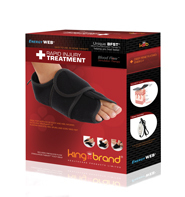 While King Brand® makes ColdCure® devices for all parts of the body, there's no better version than the ColdCure® Foot wrap. Put it on and you will instantly feel relief and relaxation as it draws the pain and tension out of your foot and body. The slipper-like design and the soft yet rigid gel pack is just like attaching a magic pain sucking pillow to the bottom of your foot. You can walk on it and it feels wonderful the entire time you are wearing it. The ColdCure® wrap looks like a slipper, but it is made entirely of very stretchy material. It wraps around your foot and applies a very gentle pressure over your entire foot area. The bottom of the wrap contains swappable cold packs of a very special design. They are soft and flexible and mold to the shape of your foot, yet the gel inside them won't squeeze out of place. Even under your full body weight, the gel provides a wonderful, cool, cushion for your sore, aching feet. Imagine having tiny waterbeds attached to the bottom of your feet - it feels like heaven! As well as staying in place, this advanced gel keeps the cold on your hot, swollen injury where you need it the most. Other gel packs will have hot and cold spots but in the gel packs used in the ColdCure® Heel Spur wrap, the cold gets transferred from the cold spots to the warm spots much more effectively. No other gel packs in the world have the temperature balancing power of our gel packs. The gel wraps completely up around the back of the heel and covers the entire bottom of your foot, targeting the entire Plantar are so the gel draws the pain and tension out of your foot and heel region. The gel packs are easily swappable and each ColdCure® wrap comes with 3 gel packs. You use them 1 at a time, keeping the other 2 in the fridge so you can swap them out as many times as you like. There's no need to take a break between treatments. You can keep using them as long as you want the pain relief. BFST® stimulates blood flow through the heel and bottom of the foot, while the patient is at rest. This is very important, because while at rest, an unaided and inflamed Heel Spur can otherwise have seriously impeded blood flow. It is the oxygen and nutrient-rich blood that enables the healing process, so adequate blood flow is required for the Plantar ligaments to heal properly and quickly. BFST® kits have 3 different power settings, so you can continue to increase the power of your treatments as your Heel Spur and Plantar Fasciitis heal. During your first treatment, your Heel and Plantar will feel quite warm. This is because your circulation is poor at first. The more you use the device, the less warming sensation you will feel. This is good. As the warmth lessens from treatment to treatment, this is an indication that the circulation in your heel and foot is improving. Better circulation means more blood flow all the time, not just during treatments. This is the goal. When you feel very little warmth during a treatment, it is time to move up to the next power level. Don't rush it though, more heat does not mean better treatment. In fact, less heat means better treatment, so take your time moving up in levels. designed to be worn even when turned off to help protect the heel and bottom of the foot from re-injury, and this goes a long way towards shortening the recovery time. Patients enjoy the support and cushioning BFST® wraps provide and appreciate that they are healing - patients like wearing them, they know it's helping them heal. This positive attitude further contributes to an overall positive recovery plan. Increase the effectiveness of your ColdCure® treatments by attaching an Accessory Strap to your Foot wrap. 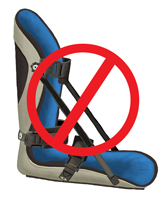 The Accessory Strap will provide you with additional compression and this means maximum pain and swelling relief. The ColdCure® wraps use XC RigiGel® technology so that the gel does not flow away from the injured area when pressure is applied. The gel stays in place even under pressure. Yet it is still soft and molds to the body. ColdCure® wraps are unique and of a higher quality and performance than any other wrap available. Nothing else comes even close. Again, like the BFST® wrap, the ColdCure® wrap is opened and closed using attached Velcro® straps that guarantee a perfect fit. The wrap and unwrap design allows for the wrap to be easily applied around a tender, injured foot without having to slip into or out of a 'sock like' device. Gel packs are notorious for having hot and cold spots. Our XC RigiGel® gel packs will help to distribute the cold energy evenly throughout the gel. When cold pressure is applied to the heel, gel starts to warm up in that specific spot faster than the rest of the gel. Our gel packs are superior to others and the cold in the gel pack gets transferred from the cold spots to the warm spots much more effectively. This is a valuable improvement as your hot swollen injury will receive the cooling power of the whole pack. The temperature balancing power of these gel packs is unmatched. The gel pack has 2 different coloured sides: a white side and a gold side. Both sides will give you all the same benefits that our high performance XC RigiGel® has to offer. The gel pack can be inserted inside the wrap with the white side in or out since the gel pack is not side specific. Note from KB WebMaster - The text below is primarily intended to assist with Google properly classifying this page content. To learn more about our products please visit our website.<br>Heel spurs plague many people. Heels spurs cause heel spur pain. There are many symptoms of heel spurs pain caused by heel injuries. Treatment for heel spurs will cause your heel spur pain to improve and your heel spur to heal. There's no doubt that to heal a heel spur quickly you need BFST treatments. Coldcure will help with heel spur pain. You can relieve heel spur pain and a heel injury with BFST and coldcure technology. So, if you want to heal your heel spur quickly, you need BFST. If you want to treat heel spur pain you need coldcure. heel spur symptoms are heel spur and heel pain and swelling. A sore heel spur can be helped with heel spur exercises although heel spur exercises won't cure all heel spur injuries. Some heel spurs require surgery. This may heal the heel spur but the pain in your heel or heel spur after surgery can be severe. The best heel spur treatment is BFST. The best heel spur pain treatment is coldcure. These wraps are incredible. They feel comfortable. They work. heel spur inflammation. heel spur surgery. heel spur pain. sore heel spur foot spurs. sore heels. pain in heel. pain in the heel. treating heel spurs. heel spurs treatment. heel spurs pain. heel spurs exercises. heel spurs symptoms. 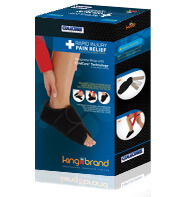 heel spur pain relief. heel spur pain exercises.